We all lie. I like your new haircut; your bum doesn’t look big in those trousers; the cheque is in the post. We also lie by omission, by not telling the whole truth or not mentioning something important at all to those who should know about it. Anna is particularly familiar with this second sort of lie. 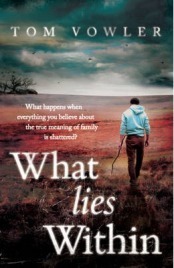 In Tom Vowler’s debut novel What Lies Within, we meet Anna living in a remote cottage on Dartmoor with husband Robert and teenage children Paul and Megan. She appears to have a good life with a kind husband and a fulfilling job as a ceramic artist working out of a studio at home, and things are taking an exciting turn with her first exhibition at a local gallery just days away. However, when an inmate escapes from the local prison, Anna seems to overreact and becomes excessively protective towards her children. She seems particularly worried about Paul, whose stereotypically teenage behaviour makes her more worried than might be expected, even in her husband’s eyes. In a dual narrative running parallel to this, a young and idealistic teacher sets out to “make a difference” in the lives of her more difficult students, only to be viciously attacked by one of them in her own home. The two narratives are gradually woven together over the course of the book to reach what most reviewers seem to describe as a shocking conclusion or ending with a twist, but which I felt was an entirely predictable and somewhat limp ending. In reading other reviews of this book, I started to feel like I had read something different to everyone else. Other reviews glowed and struggled to find points to criticise on; I read a book that made me cry out “is that it?” when I finished the final page. Granted, Vowler has a nice use of language and writes from a woman’s perspective remarkably well, it is just that the book as a whole seem to lack substance and left me unmoved, unaffected and expecting a final piece of drama or excitement that never came. This might have been because What Lies Within has been misleadingly marketed as a psychological thriller, which it most certainly is not, and the end result was an over-riding sense of disappointment. I feel that I should apologise, but this book just wasn’t for me at all. No Comments on "What Lies Within"